Cedar Stone Ranch invites you to an exclusive location adjoining scenic Skagway Reservoir and State Wildlife Area! This unique trophy property has picture postcard views of the reservoir and miles of unspoiled nature in the Pikes Peak back-country. 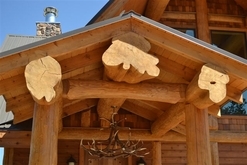 Complimenting this pristine setting is an impressive log home constructed of imported Western Red Cedar logs from British Columbia. With a warm and inviting charm, this mountain retreat welcomes you home with its comfortable furniture and furnishings, many of which are negotiable. An open great room features vaulted ceilings, a stone fireplace and expansive deck which highlight the incredible lake and mountain scenery. Find upscale finishes throughout – the gourmet kitchen is accented by rustic edge granite, alder cabinetry, Italian stone farm sink and quality appliances. A custom, aromatic red cedar staircase leads to a master suite and a bath appointed with copper slipper tub, stone, granite and vessel sinks. The finished lower walkout offers a family gathering area and covered patio complete with hot tub for evening relaxation and star gazing. Walk directly from the house onto the shores of the reservoir to boat or fish for rainbow and cutbow trout that are stocked annually. Explore the varied terrains on the property from a pastoral valley with an intermittent stream to its rolling meadows and scattered aspen. The avid sportsman/hunter will easily find a wide variety of game options such as elk, mule deer and turkey both on the property and in the bordering BLM Lands and nearby Pike National Forest. Occasional coyotes, bears, mountain lions and bobcats also frequent the area. Endless selections of other recreational pastimes are within close proximity - camping, hiking, skiing to white-water rafting and exploring area history (gold mining) and scenic landmarks. Private, gated, hidden and a simply amazing, Cedar Stone Ranch is a perfect tribute to a one of a kind setting!